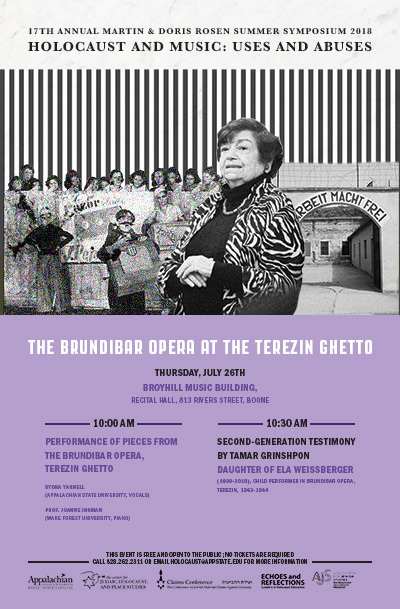 Appalachian State University’s Center for Judaic, Holocaust, and Peace Studies invites the public to a performance of passages of the children’s opera Brundibár in the Nazi-established ghetto and camp of Terezin and a presentation by Ms. Tamar Grinshpon, the daughter of one of the child actors, Ela Weissberger, z’’l. The events will take place at the Recital Hall of the Broyhill Music Center (813 Rivers Street, on the ASU campus) on Thursday, July 26. The musical performance will begin at 10:00 am; the talk by Ms. Grinshpon at 10:30 am. Brundibár is an opera by Czech-Jewish composer Hans Krása that he reconstructed as a prisoner of Theresienstadt/Terezin and first staged with an all-children’s cast in this Nazi-established ghetto near Prague in the fall of 1943. In the opera, young children with the support of courageous animals defeat the devilish organ grinder Brundibár. Despite its anti-Hitler elements, the Nazis used the opera in a propaganda film that disguised the horrific conditions in the ghetto. Most performers were later deported and killed in Auschwitz. The program includes performances of selected passages of the opera by ASU student vocalist Sydra Yarnell accompanied by Wake Forest University pianist Prof. Joanne Inkman. After the performance, Ms. Tamar Grinshpon, the daughter of Ela Weissberger, z’’l, who played the cat in Brundibár as an imprisoned child in Terezin, will speak. Ms. Grinshpon was born in Haifa, Israel, and grew up in New York. Her mother, Holocaust survivor Ela Stein Weissberger of Blessed memory, was raised in Czechoslovakia in the 1930s. In early 1939, Nazi German troops marched into Prague and established the Protectorate of Bohemia and Moravia. One of the early measures was the expulsion of Jewish children from public school. The persecution soon worsened and, along with her sister and mother, Ela Stein Weissberger was deported to Terezin. She was one of about a hundred Terezin children who survived the genocide. She dedicated the last thirty years of her life to giving testimony to the events and her experiences in Terezin. For the last ten years, Tamar accompanied her mother Ela to speaking engagements around the world to help honor and remember the victims of the Holocaust. Tamar Grinshpon currently resides in Cary, North Carolina. The presentation is part of the 17th Annual Martin and Doris Rosen Summer Symposium on Remembering the Holocaust that takes place from July 21 until 26, 2018, at Appalachian State University's Plemmons Student Union and the Broyhill Music Center. This year’s symposium puts a particular emphasis on the role of music and its uses and abuses during this genocide. The event is organized by Appalachian’s Center for Judaic, Holocaust, and Peace Studies and named for symposium benefactors, the late Doris and Martin Rosen. The symposium is sponsored by The Conference on Jewish Material Claims Against Germany, the Martin and Doris Rosen Endowment, the Community Advisory Board of the Center for Judaic, Holocaust, and Peace Studies, Appalachian’s College of Arts and Sciences, the Hayes School of Music, the Boone Jewish Community/Temple of the High Country, Havurah of the High Country, the Ruth and Stan Etkin Symposium Scholars’ Fund, the Leon Levine Foundation, the North Carolina Council on the Holocaust, Echoes and Reflections of Yad Vashem (in collaboration with the USC Shoah Foundation and the Anti-Defamation League), and the AJS Distinguished Lectureship Program at the Association of for Jewish Studies. The musical performances and talk are free and open to the public and no tickets are required. For a schedule of events and complete list of symposium speakers, please visit https://holocaust.appstate.edu/symposium. For more information, call 001.828.262.2311 or email holocaust@appstate.edu.